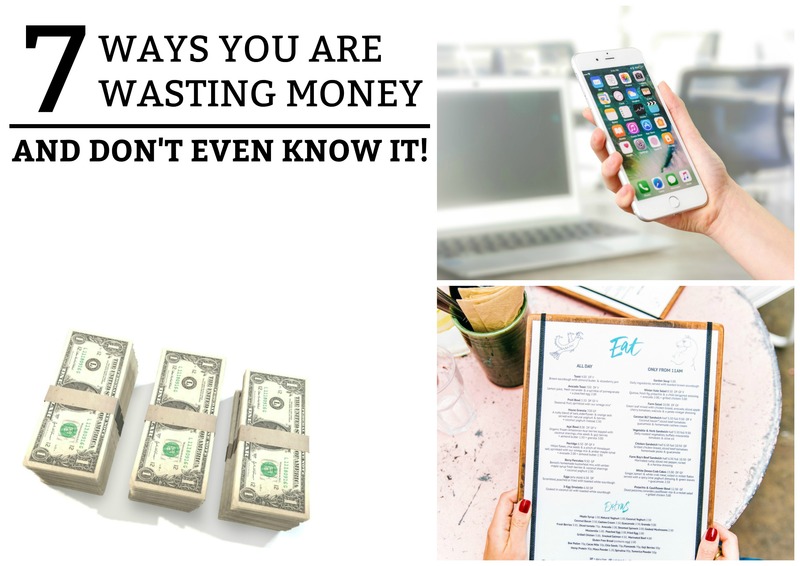 7 Ways You’re Wasting Money and Don’t Even Know It! Have you ever found yourself wondering where your paycheck is going to? Chances are, you are unnecessarily spending it on things you may not even realize! Money-wasting is something we all experience at some point in our lives, however some people never conquer this bad habit. To eliminate money-wasting habits in my life, I adopted the motto, “Have a name for every dollar.” This way, I would never spend any money without knowing how much I had left over. Perhaps you have never taken the life-changing step of creating a successful budget. This would help to eliminate some of the major ways you may be wasting money without even noticing it! Below are 7 of the main culprits. Today’s society heavily caters to people who have never developed cooking skills. However, never learning how to cook is a very expensive mistake. Quick meals, fast-food runs, weekend dates, and work lunches can add up VERY QUICKLY! These habits could easily be costing you $250+ per month. Crazy! Make an effort to learn how to meal prep. It can be super easy! Write down the quickest and healthiest meals you already know how to make. Pinterest and Google “healthy quick meals”. You will be surprised what you find! Make a list of ingredients you will need to make those meals. View this as a challenge! If possible, try to go grocery shopping on the weekends and plan your meals out in advance. These Sunday hacks for a productive work week will give you some additional information. Believe it or not, you are probably overspending on your cellphone plan. I have several friends who are paying over $120 per month for their cellphone plan. Those prices are ridiculously high! Several times a year, cellphone companies come out with some fantastic deals! For instance, four family members and I are on a plan for $35 per month – unlimited everything with T-Mobile. My biggest tip to you: don’t ever sign a contract! Contracts are a brilliant way to lock you into paying far more than you should, while preventing you from finding a better plan. Be patient and wait for a deal. Do your research and call a few cellphone carriers – you can always find a better price. Insurance companies have a bad habit of increasing your rates even when you have a perfect driving record. A few months ago my Geico premium suddenly increased by $20/month. I shopped insurance providers and found a much better offer. I saved myself $300/month by switching to Progressive. Pro Tip: research insurance rates once every 6 months. Don’t let insurance companies increase your rates “just because”. Take some time to do a little research – your wallet will thank you. I use to feel that I always had to buy brand-name food because I was under the impression that the taste quality was far superior. Wrong! I did some research and found out that many off-brand products are made at the same factories as the more expensive brand-name products. I decided to start buying Walmart’s Great Value brand and have saved hundreds of dollars already. Although there will always be certain items that you can’t buy off-brand, it is important to be aware of your shopping habits. Pro Tip: Try out a discount grocery store. Their prices are typically significantly lower! Guilty as charged! In the past, there have been so many times that I have found myself throwing out groceries that I never used. This was all because of a lack of planning on my part. Sit down for a few minute and plan out your meals for the week. Make a list of food that you will use and only buy those items. Also, leftovers are a wonderful way to make an easy lunch for the next day! I almost always cook extra food for dinner meals, so that I can package it up for meals the next day. Everyone loves dropping by their local coffee shop every once in a while to buy a delicious caffeinated beverage! However, if you are purchasing coffee every single day, you are wasting a lot of valuable money. Let’s be honest, Starbucks drinks are delicious. But they are outrageously priced! If your work has a coffee station, chances are they charge you at least $1.00. If coffee is a daily necessity for you, try making it yourself each morning. Buy an insulated coffee mug, which can keep your coffee warm for hours. helped save my budget! How many items do you pay for and don’t really use that often? For instance, cable TV, subscriptions, gym memberships, etc. Carefully examine your bank account or credit card statements for memberships and subscriptions that you can eliminate from your life. How often do you use that service or membership? Is it really worth spending all that money on? I came to the conclusion that I was wasting money on my gym membership simply because I preferred to find easy ways to work out from home. Never pay for something that you are not 100% committed to. Otherwise, it is just a waste of money. I cannot end this article without urging you to take these steps to creating a successful budget. They are simple and easy to follow, yet they have the ability to completely change your personal finances for the better. If you have any questions about this article, just let us know in the comment section below! We’d be happy to help you out! This post contains affiliate links. This means that we will earn a small commission if you click through and make a purchase. This adds no additional cost for you. Also, we only recommend products that we know and trust.